Digital artwork is required for all custom decorating. Camera-ready art is defined as digital files in vector format. This includes Illustrator, Illustrator EPS, InDesign or PNG (with transparent background). Files must be a minimum of 300dpi at 100% of reproduction size. Art should be submitted in the original format it was created. Digital artwork is required for all custom silk screened products. Camera-ready art is defined as digital files in vector format. The preferred format includes Illustrator, Illustrator EPS or InDesign. PNG files (with a transparent background) may be submitted, but must be a minimum of 300dpi at 100% of reproduction size. With a firm order, we will provide one sample for approval before final production. A net charge of $75.00 must be paid in advance to request one imprint sample without a firm purchase order. This charge also applies if your order is canceled after receipt of sample, prior to production. The $75.00 net charge is in addition to the set-up charge. The setup charge is net $50.00 for one color, one side. Each additional side and color is net $25.00 each. There is a one-time film charge of $15.00 net per color. All pricing is calculated on net customer pricing plus any applicable decorating fees. The per-piece imprint charge ranges from $0.35 to $0.75 net per piece, per color, per side. Please contact customer service for specific item charges. All orders are sold in full case lots only. MOQs are dependent on the item ordered. Please contact customer service for more information. Lead time for production is 6 weeks from date of order entry providing base item is in stock. Contact your local Carlisle Sales Representative or your Customer Service at 1-800-654-8210 for more information. CUSTOM DECORATED ITEMS ARE NOT ELIGIBLE FOR RETURN OR EXCHANGE. 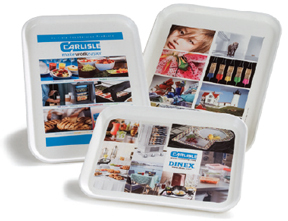 Since the item to be decorated governs the design possibilities, details of all artwork must be submitted to Carlisle FoodService Products for consideration before any order can be accepted. Artwork must be darker than the item to be decorated. 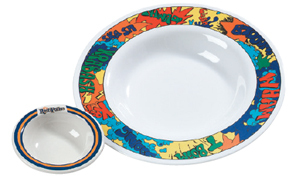 Digital artwork is required for all custom decorated dinnerware. Camera-ready art is defined as digital files in vector format. The preferred format includes Illustrator, Illustrator EPS or InDesign. PNG, EPS, TIF or JPG files may be submitted but must be a minimum of 300dpi at 100% of reproduction size. With a firm order, we will provide one sample for approval before final production. A net charge of $250.00 must be paid in advance to request one imprint sample without a firm purchase order. This charge also applies if your order is canceled after receipt of the sample, prior to production. Please contact customer service for specific item charges. All orders are sold in full case lots only. Custom decorated dinnerware requires an MOQ of 1,200 pieces of each item number or SKU. Lead time for production is up to 12 weeks from date of order entry. Digital artwork is required for all custom decorated trays. Art should be submitted in vector format. The preferred formats include Illustrator, Illustrator EPS or InDesign. Alternate file formats include PNG, EPS TIF or JPG, but must be a minimum of 300dpi at 100% of reproduction size. All type should be converted to outlines. For standard fiberglass trays, print area extends to 1/2" from the trays’ inside edges and artwork must be darker than the item to be decorated. For fiberglass wrap trays, a 2" bleed should be included in artwork files. With a firm order, we will provide one sample for approval before final production. A net charge of $75.00 must be paid in advance to request more than one sample tray or for one imprint sample without a firm purchase order. This charge also applies if your order is canceled after receipt of the sample, prior to production. The $75.00 net charge is in addition to any other imprinting charges. All pricing is calculated on net customer pricing plus any applicable decorating fees. There is no print charge for minimum orders of 144 each and above. Orders for 72-143 each will be charged net $0.50 per tray. Custom Color Standard Fiberglass Trays require an MOQ of 144 per color. Wrap Trays require an MOQ of 144 pieces per design. Lead time for production is 6 weeks from date of order entry. Digital artwork is required for all custom Café and Bistro Tray products. Camera-ready art is defined as digital files in vector format. The preferred format includes Illustrator, Illustrator EPS or InDesign. PNG files (with a transparent background) may be submitted but must be a minimum of 300dpi at 100% of reproduction size. Decorating is limited to one color. To provide you the best product possible, the supplied artwork should not have any bold detail. All bold or large wording should be in outline format with lines 1/8" and up to 1/4". With a firm order, we will provide one sample for approval before final production. A net charge of $75.00 must be paid in advance to request one imprint sample without a firm purchase order. This charge also applies if your order is canceled after receipt of the sample, prior to production. The $75.00 net charge is in addition to the set-up charge. 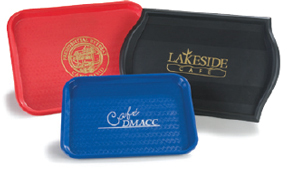 Café and Bistro Trays cannot be approved from a digital proof. A physical sample must be approved before production will begin. The setup charge is net $50.00. There is a one-time die charge of $80.00 net per design. All pricing is calculated on net customer pricing plus any applicable decorating fees. 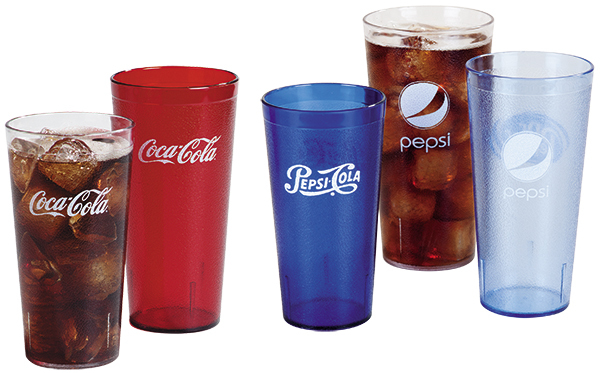 The per piece imprint charge is net $0.35. All orders are sold in full case lots only. Custom decorated Café or Bistro Trays require an MOQ of 288 pieces of each item number or SKU. Café Trays – Lead time for production is 6 weeks from date of order entry providing base item is in stock. Bistro Trays – Please contact customer service for availability. Digital artwork is required for all custom waste container products. Camera-ready art is defined as digital files in vector format. The preferred format includes Illustrator, Illustrator EPS or InDesign. PNG files (with a transparent background) may be submitted but must be a minimum of 300dpi at 100% of reproduction size. Decorating is limited to one color. Black or white imprint is standard stocked colors, contact Customer Service for a complete list of available imprint colors. Due to the size of the waste container products, physical samples are NOT provided. There is a one-time die charge of up to $900 depending on die size. Contact Customer Service for a price quote. All pricing is calculated on net customer pricing plus any applicable decorating fees. The per piece imprint charge is net $2.00 per side. All orders are sold in full case lots only. New orders for custom decorated waste containers require an MOQ of 96 pieces of each item number or SKU. 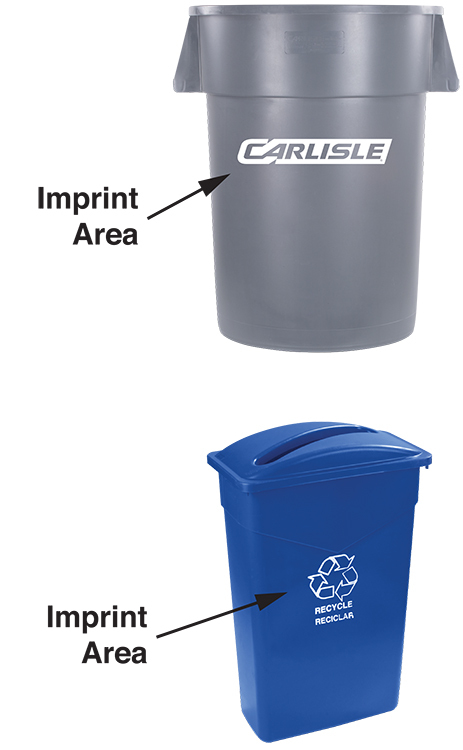 Reorders for custom decorated waste containers require an MOQ of 48 pieces of each item number or SKU. Lead time for production is 6 weeks from date of order entry for black or white imprint, providing base item is in stock. Digital artwork is required for all custom warewash products. Camera-ready art is defined as digital files in vector format. The preferred format includes Illustrator, Illustrator EPS or InDesign. PNG files (with a transparent background) may be submitted but must be a minimum of 300dpi at 100% of reproduction size. Decorating is limited to one color. Black or white imprint is standard stocked colors, contact Customer Service for a complete list of available imprint colors. Digital artwork is required for all custom warewash products. Camera-ready art is defined as digital files in vector format. The preferred format includes Illustrator, Illustrator EPS or InDesign. PNG files (with a transparent background) may be submitted but must be a minimum of 300dpi at 100% of reproduction size.